An Adventure for the Senses! With the release of her fourth children's picture book, author Susan Chodakiewitz brings a new concept to storytelling. By integrating a picture book with an herbal infusion tea to complement the story, Master Davey and the Magic Tea House uses the senses to create a unique reading experience for both children and their parents to enjoy together. Co-authors Susan Chodakiewitz and The Coffee Bean & Tea Leaf® Director of Tea David DeCandia were inspired by Chinese myths about the magical tea gardens of Emperor Shen Nong (2737 BCE) and a rare, extinct Blue Tiger, last spotted in China more than 100 years ago. 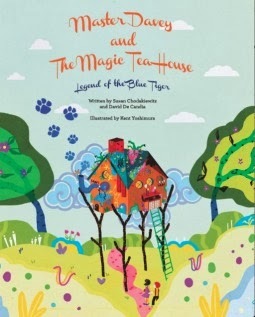 “While working with David as he created the Blue Tiger herbal infusion for the book, I knew we had discovered an imaginative way for children to engage in the story with more than just their eyes and ears, but also through their sense of smell and taste,” says Chodakiewitz. 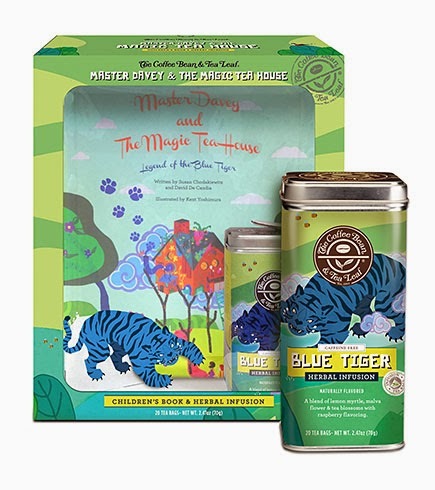 Readers are encouraged to sip the new caffeine-free Blue Tiger herbal infusion while enjoying Hopper and Camelia's magical tea journey. This book was adorable!! The book alone is very well written and illustrated. It has a truly magical feel as Hopper seeks to help Camelia find the Blue Tiger Tea Tree to save her family's tea farm. The location of the very special tree is only know by ancient Emperor Shen Nong and the boy who is foretold to be keeper of the Blue Tiger tea. The kids sat mesmerized at the tale! The illustrations really were wonderful, and vibrant, giving a lot of Chinese character to the pictures. As I sat and read we had the Blue Tiger tea from The Coffee Bean and Tea Leaf, specially inspired for this book. It really heightened the book with the scent of tea brewing as we read. It was about as close to being there as we could be. The tea was wonderful, and came in individual tea infusion bags, making it easy and ready to brew. It has nice light fruity taste to it, the kind kids love best. I highly recommend this set for the holidays coming up! Master Davey and the Magic Tea House will be available starting September 3 for $12.95. Twenty-count tea bag tins of the Blue Tiger Herbal Infusion will be available for $9.95. The hard cover book will also be available as a part of The Magic Tea House Gift Set, paired with a Blue Tiger tea tin, for $24.95. All items will be available while supplies last online at coffeebean.com and at select The Coffee Bean & Tea Leaf ® locations worldwide. Awww this sounds like such a wonderful book! It would be a great gift for a little girl who loves to give "Tea" parties!